Electric RC helicopters are becoming so popular that RC helicopter manufacturing giants who used to stick with gas models are starting to produce electric ones. 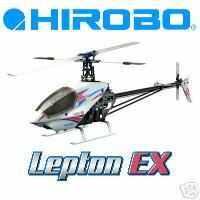 Recently, Hirobo follows that trend and released a new high-end electric RC helicopter, the “Lepton EX-3D”. This model is one in which Hirobo claims is capable of flying the most advanced 3D maneuvers right out of the box – a claim in which RC Flying Thailand sets out the test. In fact, before actually getting their hands on this model, RC Flying has had two chances to see it in flight. In both occasions the flight was flown under constant heavy winter wind. Nevertheless, the Lepton didn’t show any problems and landed safely. Therefore, even without flying it, it is safe to say that the claim that this model is extremely wind-resistant is well founded. The Lepton EX-3D is a world class helicopter made by a world class RC helicopter manufacturer who aims to please advance pilots. The whole model stands just slightly smaller than a typical .32 gas model, making it durable, wind resistant while at the same time easily transportable. Hirobo Japan positions the Lepton EX-3D as one of their top models. In this honor, they gave the model two separate but integrated bodies. The outer made of Carbon Hybrid and the inner made of Magnesium. These two bodies serve to eliminate vibrations and the combination boasts a 200% increase in heat dispersion rate as opposed to aluminum. Experts claim that the integration of two bodies is the secret of making the Lepton EX-3D wind resistant. The Head is made of aluminum and the rotor blades are made of fiberglass. As for the battery, if you decide to purchase the “combo” version, the Lepton comes with a 4-cells Li-Po battery along with a “Balance Cell” charger. The battery takes one hour to charge – which will allow for an 8 minute worth of normal flight or 5 minutes worth of 3D flight.